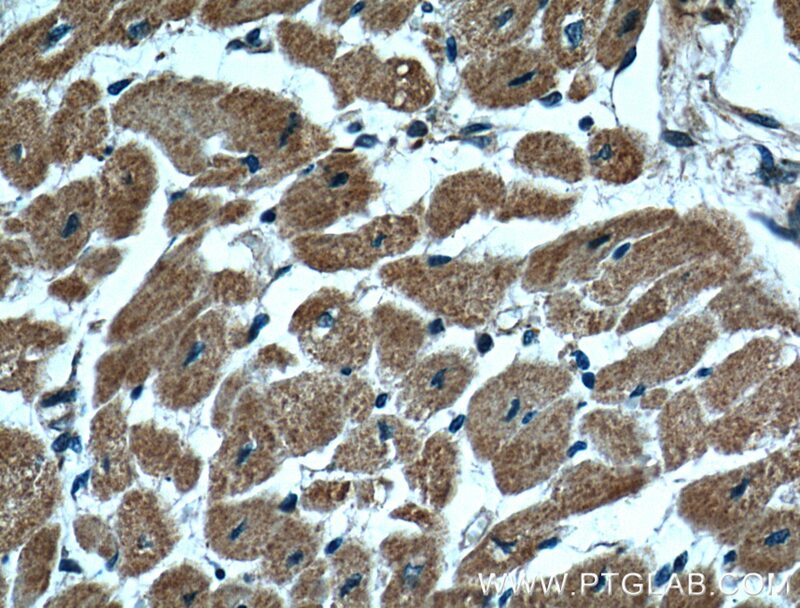 Immunohistochemical analysis of paraffin-embedded human heart tissue slide using 66271-1-Ig( CLPP Antibody) at dilution of 1:200 (under 40x lens). CLPP is the putative ATP-dependent Clp protease proteolytic subunit and also named as endopeptidase Clp. It belongs to the peptidase S14 family. Clp cleaves peptides in various proteins in a process that requires ATP hydrolysis. It may be responsible for a fairly general and central housekeeping function rather than for the degradation of specific substrates. This protein has a transit peptide of 56 amino acid. Enhancing mitochondrial proteostasis reduces amyloid-β proteotoxicity.